As hundreds of thousands flee to Russia to escape the bloody offensive of the Western-backed Ukrainian regime against pro-Russian forces in east Ukraine, the risk of an all-out war between Ukraine and Russia that could involve the Western powers is rapidly rising. NATO accused Russia yesterday of preparing to invade east Ukraine to crush the Ukrainian offensive. “We’re not going to guess what’s on Russia’s mind, but we can see what Russia is doing on the ground—and that is of great concern. Russia has amassed around 20,000 combat-ready troops on Ukraine’s eastern border,” NATO spokeswoman Oana Lungescu announced yesterday. Moscow could use “the pretext of a humanitarian or peace-keeping mission as an excuse to send troops into Eastern Ukraine,” she added. US officials demanded that Moscow cut off all aid to pro-Russian forces in east Ukraine, allowing the Western-backed, far-right regime that came to power in this February’s fascist-led putsch in Kiev to seize control of the entire country. “When addressing the humanitarian situation, we cannot lose sight of one underlying fact: Russia can stop this. The surest way to end the violence is for Russia to stop the flow of fighters, weapons, and money from Russia into eastern Ukraine,” said US Deputy Ambassador to the UN Rosemary Di Carlo. DiCarlo’s remark indicates the political dynamic underlying the Western imperialist powers’ intervention in Ukraine. NATO is backing a violent, far-right regime waging war against the Ukrainian population, aiming to force Russia to publicly disavow pro-Russian sentiment in east Ukraine in a humiliating climbdown, or to invade east Ukraine and launch a major land war in Europe. This underscores the utterly reckless and reactionary policy of the Western powers, which are driving the crisis in Ukraine to the brink of world war. The Ukrainian military is proceeding with enormous brutality against east Ukrainian areas held by separatist rebels. On Tuesday evening, the air force conducted bombing raids for the first time against the city of Donetsk with its one million inhabitants. The city is controlled by pro-Russian separatists. According to local residents, at least two civilians were killed, and the city administration reported heavy artillery shelling of houses. Russian investigators have reported evidence for the use of phosphorus bombs by the Ukrainian military. “A soil sample showed that the army has used prohibited incendiary bullets near Slavyansk,” declared a spokesman for an investigating agency in Moscow. Phosphorus bombs are outlawed by the Geneva Convention of 1949. The barbaric actions of the Ukrainian army are being accompanied by the fierce repression of opponents of the war throughout Ukraine. The fascist gangs of the Svoboda Party, which were represented in government up until the end of last month, and the paramilitary Right Sector, play a crucial role. Already one month ago, President Petro Poroshenko ratified a law punishing supporters of the insurgency in the Donetsk Basin (Donbas) with prison sentences of between five to seven years. According to reports by opposition figures, this law is now being used against striking workers in the north and east of the country. Often, just a critical remark criticizing the government on Facebook is sufficient for prosecution proceedings. According to the German daily Junge Welt, five police officers were dismissed last weekend after they sought to protect a pop concert against an assault by right-wing thugs in the port city of Odessa. In May, Odessa was the scene of a fascist massacre of opposition protesters. The right-wing thugs last weekend were allowed to operate without hindrance. The police refused to initiate any investigation against them. 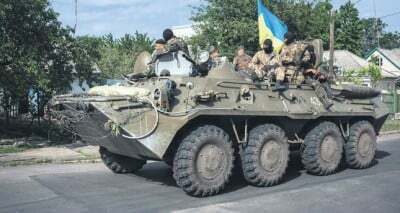 Particularly vicious forms of cooperation are taking place between the state apparatus with fascist gangs in the territories reconquered by the Ukrainian armed forces. The pro-Western Internet newspaper Pravda Ukrainskaya, has reported that units of the National Guard and the fascist Right Sector have abducted a large number of suspected collaborators. Mid-level officials often disappear for weeks in secret cellars. The National Guard announced on their website that its forces would shoot at all cars that do not stop at roadside controls. The terror conducted against the population is part of a broad government campaign to stabilize the Kiev regime through dictatorial measures. On Friday, Poroshenko declared that he planned elections on October 12 after the fascist Svoboda and the pro-Western UDAR party quit the government on 24 July, leaving Premier Arseniy Yatsenyuk without a majority. If he is unable to assemble a new coalition by August 24 then, according to the constitution, Poroshenko can dissolve parliament and call new elections. Poroschenko’s announcement of the dissolution of Parliament was accompanied by angry threats against his political opponents. “I don’t know how to work with parliament where the majority of people represent a ‘fifth column’ which is controlled from abroad, whole factions. And the danger of this is only rising,” he said. He cited the fact that half of the deputies refused to classify the rebels in the east as terrorists. Although many deputies have already been forced to leave the country or have changed fraction, representatives of the Party of Regions remain in Parliament. The Party of Regions’ government led by former President Viktor Yanukovych was deposed by a fascist coup in February. Together with members of the Communist Party of Ukraine, they maintain an orientation towards Moscow and are critical of the new regime. The designation of these deputies as a “fifth column” is equivalent to accusing them of collaboration with the insurgents in the east and opens them up to criminal proceedings. Already, opposition parties are being dismantled step by step. Two weeks ago, a deputy of the Party of Regions, Nikolai Levchenko, was excluded from parliamentary sessions after he criticized the government’s actions in the Donbas. The head of the Communist Party, Petro Simonenko, was physically attacked in parliament by representatives of Svoboda. In February, the central office of the Communist Party was occupied by fascist militias and then eventually burned down in April. Last month, the Communist Party was denied fraction status in parliament, and the Department of Justice submitted a petition to ban the party, which had received more than 13 percent of the vote in the last election. Under these conditions, the elections in October are aimed at providing a false veneer of democratic legitimacy for war and deep social austerity. In his war against the Ukrainian people, Poroshenko is not only intent on pursuing his military offensive against the east but also enforcing the comprehensive attacks on social rights prepared following the coup in February by the European Union and the International Monetary Fund (IMF). Last week the parliament in Kiev passed a war tax of 1.5 percent on all taxable income together with a massive increase in general tax rates. “War is no reason to delay reforms,” Poroshenko said in a television interview. A few weeks ago, the Treasury announced that it would cut subsidies to the country’s mines and an already agreed increase in the minimum wage (currently 45 cents per hour), was withdrawn, as was the proposed linking of pension rates to wages.